It’s graduation time and the stainless steel TAG Heauer TAG-CV201C Chronograph watch is a great gift for any man. This timepiece is an everlasting keepsake that will usher in the new graduate’s future with style and precision. 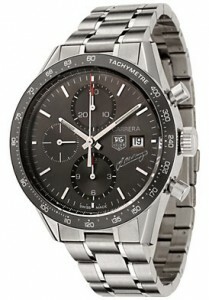 The Chronograph is fashioned with a medium grey dial surrounded by silver tones. Even the hands are in silver, which makes this the ultimate masculine watch. The sapphire crystal case is water resistant up to 50 meters. Time is never off with TAG Heuer’s Swiss Caibre 16 movement and subdials for one minute, one hour and twelve hour increments. Other great features of this 50th Anniversary of J.M. Fangio timepiece are a built-in calendar, a grey bezel Tachymeter scale and a push-button clasp on the stainless steal wristband. The hands and hour markers are also illuminated for quick and easy time reference. J.M. Fangio was one of the greatest Formula One racecar drivers of all time. He wore the TAG Heuer Chronograph during a champion win fifty years ago. Not only does this watch carry a slice of history with it, but is part of the amazing Carrera collection, which is unmatched in quality.